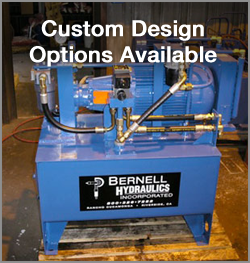 At Bernell Hydraulics, we have the knowledge and experience needed to take excellent care of any sort of hydraulic equipment Long Beach CA that you might have. We can provide parts and service for industrial, mobile, and agricultural systems. Here is an overview of the major services we offer for hydraulic equipment Long Beach CA. Next time you have a problem with your hydraulic hoses, contact Bernell Hydraulics for 24-hour onsite service. We can send a skilled technician right to your place of business to provide repairs or install new hoses as part of our HoseDoctor service. All you have to do is give us a call and let us know what hoses to bring. We can even bring custom hose assemblies made in our shop if you request them in advance. We can also provide a wide range of preventative maintenance and repair services, both in our shop or at your work site. We can handle everything from simple filter replacements to thorough power flushes to remove contamination from your hydraulic equipment Long Beach CA. We can rebuild pumps, cylinders, valves, and motors from all major brands, or even make custom parts for you. Everything we create or rebuild in our shop is subjected to thorough testing before we install it in your equipment, to ensure that the job gets done right the first time. Another important part of our business is selling authentic Parker parts for all kinds of hydraulic equipment. Because of Parker’s commitment to excellence, this 100-year-old company is constantly improving on its designs and turning out new and improved products. Buy Parker components from Bernell Hydraulics and let Parker change your hydraulic system’s performance too. We can help you select the perfect parts from our shelves or the Parker product catalog.